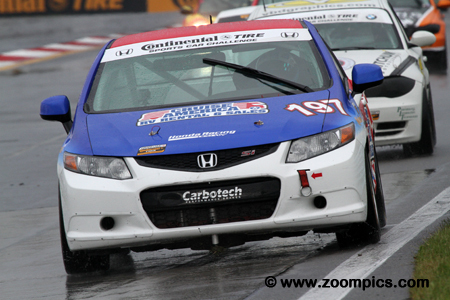 KONI’s sponsorship agreement with the Grand-Am Cup series ended with the final race of 2009. 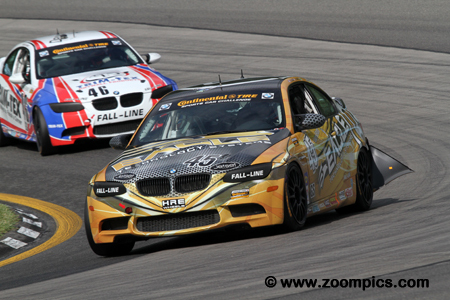 Replacing KONI in 2010 was Continental Tire – the championship was renamed the Continental Tire Sports Car Challenge (CTSCC) series. Little changed as the result of this new partnership – the series continued with the same classes and ran as a support event for the Grand-Am Rolex Sports Car championship. The 2013 season consisted of eleven race weekends and started in January at Daytona International Speedway which was followed by the series’ first visit to Circuit of the Americas. In April, the championship would make a stop a Barber Motorsports Park and then two-weeks later, move on to Road Atlanta. Round five took place at the Mid-Ohio Sports Car Course which was followed by Watkins Glen International. At the end of July, teams made their way to the Indianapolis Motor Speedway. Next on the schedule were Road America and Kansas Speedway. The penultimate round was held at Mazda Raceway Laguna Seca with the finale taking place at Lime Rock Park. Grand Sport (GS): The quicker of the two classes - this group features the larger displacement engines as well as smaller four-cylinder motors with forced induction systems. The power-plants produce between 400 and 500-horsepower. Minimum weights range between 2,900 – 3,300-pounds which are dependent on the motor configuration and displacement. This class includes cars such as the BMW M3, Aston Martin Vantage, Ford Mustang Boss 302 R, Porsche 997, Porsche Carrera, Chevrolet Camaro GS.R and Nissan 370Z. Street Tuner (ST): The smaller displacement cars compete in this class in which engines typically produce between 220 and 280-horsepower. Popular vehicles found in this group are the Nissan Altima, Porsche Boxster, Mazda Speed 3, Mazda MX-5, Honda Accord Si, BMW 328i, Volkswagen Jetta and BMW 128i. 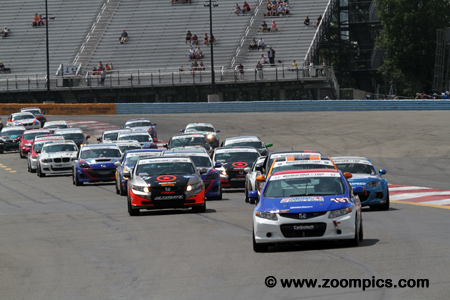 Watkins Glen was race-six of the eleven-round 2013 Continental Tire Sports Car Challenge series. Drivers would compete on the eleven-turn 3.40-mile road course for two-hours, thirty-minutes in the Continental Tire 150 at The Glen. 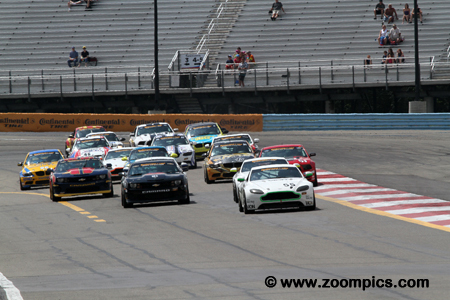 Twenty-one Grand Sport competitors exit Watkins Glen’s corner one and head for the second turn on the first lap of the Continental Tire 150 at The Glen. Leading the way is the pole-winning Multimatic Racing Aston Martin Vantage driven by Jade Buford. Behind Buford is another Multimatic Aston Martin shared by Nick Mancuso and Frank Montecalvo. Bryan Sellers, driving the Trim-Tex Fall-Line Motorsports BMW M3, only led a single lap during the Continental Tire 150 at The Glen but it was the most important one. 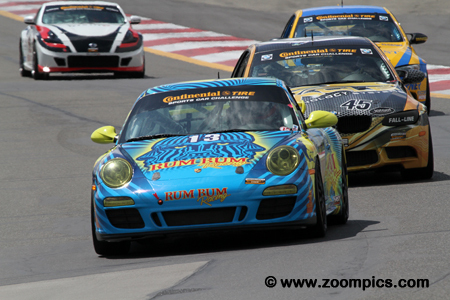 Sellers passed the race leader, Matt Plumb in the Rum Bum sponsored Porsche at the beginning of the final lap and held on to win by a margin of 0.527-seconds. This was the first victory of the season for Sellers and his co-driver, Mark Boden. For the fourth time in six races the No. 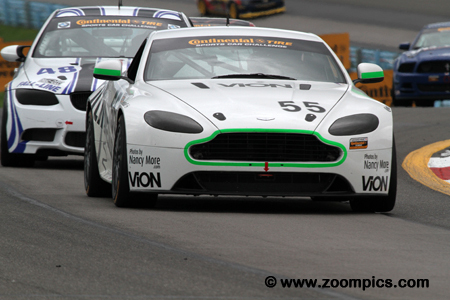 55 Multimatic Motorsports Aston Martin Vantage qualified on the pole position – in fact, it was the team’s fifth start on the front row. Unfortunately, drivers Scott Maxwell and Jade Buford could not deliver the same performance in the races. Their best result to date was a pair of fourths at Barber and Road Atlanta. The Glen would be no different as the duo finished fifth. 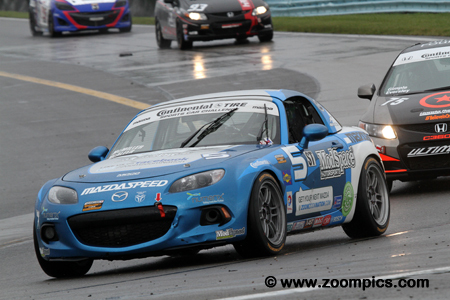 Street Tuner competitors, Stevan McAleer and Marc Miller scored their second victory of the season at Watkins Glen International. The No. 5 Mazda MX-5 started from the fifth grid position. McAleer was behind the wheel and third in class as the event entered the final thirty minutes. In front of him, the class leaders, Pierre Kleinubing and Ryan Eversley slid off the course allowing him to grab first place and the win. Nick Longhi and Matt Plumb shared the driving duties on the No. 13 Porsche 997. Starting seventh, Longhi drove the first stint and was involved in an incident on the opening lap. He and Matt Bell, driving the No. 9 Chevrolet Camaro made contact in turn-nine. The hood on the Porsche was damaged but Longhi made it to the pit for repairs. Plumb led laps-33 to 48 but could not hold off Bryan Sellers and finished second. The first lap of the Continental Tire 150 at The Glen and the pole-sitting RSR Motorsports prepared Honda Civic Si shared by Corey Fergus and Owen Trinkler leads the thirty-two Street Tuner entries into corner two. Immediately behind the RSR Motorsports Honda are the Murillo Racing BMW 328i, the Compass 360 Honda Civic Si and a Mazda MX-5 from CJ Wilson Racing. 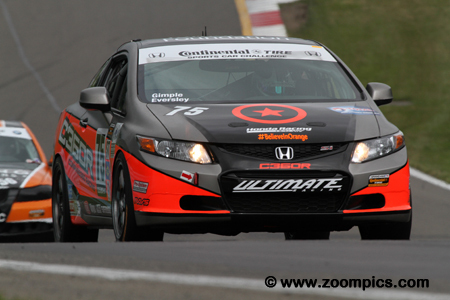 With less than thirty minutes left in the contest, Ryan Eversley driving the No. 75 Honda Civic was in second place trailing the Street Tuner leader, Pierre Kleinubing. The pair slid off the track and drove through the gravel trap at corner eight. 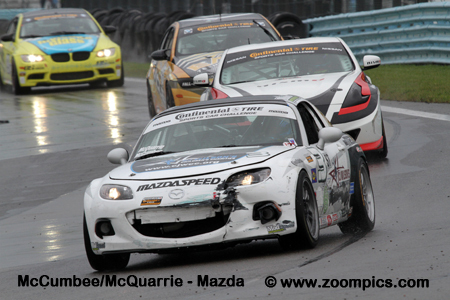 Stevan McAleer took first place but Eversley was able to regroup and maintain his position. He chased McAleer but was 0.764-seconds behind the winner at the finish. In the second of two practice session, Hugh Plumb recorded the fastest lap driving the Fall-Line Motorsports prepared BMW M3. Unfortunately for Plumb and his co-driver, Al Carter, they could only manage the eighth quickest time in qualifying. The pair made good progress during the event and finished third in the Grand Sport category. 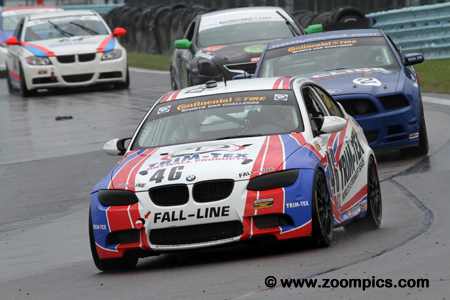 The Fall-Line BMW entries finished first, third and fourth. Defending Street Tuner class winners, Chad Gilsinger and Michael Valiante were gridded third for the start of the race. 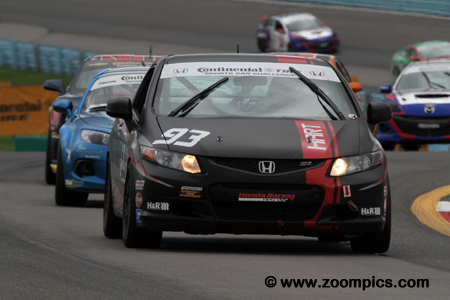 Driving the Honda of America Race Team prepared Honda Civic Si the pair were in contention for the entire event. Just before the last caution, the two class leaders went off course which allowed the No. 93 Honda to capture the final spot on the podium. The No. 197 RSR Motorsports Honda Civic Si was driven by Corey Fergus and Owen Trinkler. The entry often showed speed – qualifying in the top-ten but not delivering the final results – their best finish to date was a fifth at Road Atlanta. It appeared that the team might have ‘turned a corner’ at The Glen when they started on the Street Tuner pole. At the conclusion of the event, they were fourth in class. Second quickest in the second of two practice sessions was Shelby Blackstock. Blackstock shared the No. 51 Mustang with Joey Atterbury. The pair was gridded sixth in Grand Sport. 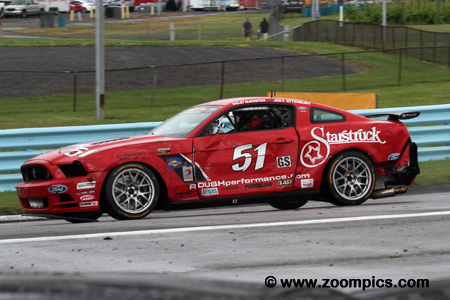 Blackstock moved into the lead on lap-10 and led for a total of fourteen circuits. With thirty-five minutes remaining in the contest, there was a downpour causing the car to go off course – they fell down the order and finished thirteenth.